Angi is a Nord ranger, and from what little information she gives, is also an outlaw. 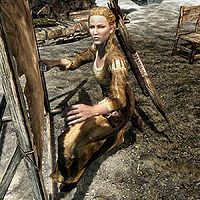 She lives in her camp, which she states she built, and can be found south of Falkreath, high upon a mountain ridge. As her story goes, she lives there because her family was killed by two drunken Imperial soldiers, upon whom she then exacted her vengeance. To reach the camp, you will have to travel far to the east, then double back to the west as you ascend the mountain. She wears a belted tunic and boots, and wields a hunting bow with fifteen iron arrows. Upon approaching her she will introduce herself and give a warning by saying "Name's Angi and if you try anything stupid I won't hesitate to put in [sic] arrow in your head." When you speak to her, you can tell her to calm down as you're not going to hurt her, to which she'll reply, "Sorry, a girl can't be too careful out here. Like I said, name's Angi and I've been living out here for a couple of years now." The other option is to tell her she's going to die, which will yield a less friendly response: "You chose the wrong girl to mess with." She'll then attack you. If you chose the first option above, you may then ask about her life which will cause her to tell her sad story. "I moved here from Helgen after my family was killed. At the time I couldn't stand to be around anyone. They all felt sorry for me and I didn't want them to. It was my problem, not theirs." Ask about the ones who killed her family and she will elaborate further by remarking, "Two Imperial drunks who thought they were above the law." You can offer to take care of the soldiers but Angi will simply remark, "Already did. Part of the reason I'm living out here now. Thanks for offering though." If you offer your sympathy to her she will become sad, and possibly even angry, and tell you, "Don't be like them. Don't feel sorry for me." Angi also offers practice in Archery and each task completed will increase Archery by 1 (up to 6 levels); she is willing to give you a free hunting bow and practice arrows, both of which are located to the left of the door to her cabin, on the outside. This bow can be a valuable asset for her archery challenges due to its rather high draw speed. Upon completion of her training regimen, and assuming you interact with her in a positive and friendly manner, she will give you her bow. Note that in the bedroom of her cabin you will find the Archery skill book The Gold Ribbon of Merit on an end table, and Treasure Map V inside it. Located just outside of Angi's cabin is an archery target area. Angi can provide you with several Archery practice sessions, resulting in a total of 6 level increases. Angi will reveal more of her past and offer her advice during each session. After the first two challenges are complete she will congratulate you by saying "Nice job hitting those targets. Let me know if you want to practice some more. Next time we'll make it a little more challenging." 1: Test of Accuracy: Hit the closest 3 targets with an arrow. In this first practice round, 1 skill point is provided for each target you hit (3 points total). "My father was rarely home, so it was my mother who actually taught me how to use a bow. She always said composure was the key to a successful archer. If you can remain calm, even in the midst of chaos, your arrow will most likely find its target." 2: Test of Speed: Hit the closest 3 targets in 8 seconds. Angi will count down from 3 and yell "Go," at which point you have 8 seconds to hit the 3 closest targets. Completing this challenge will get you 1 additional skill point. "My older brother took me out hunting a lot when I was little. At the time, it was difficult to keep food on the table, let alone have enough left over to sell at the market. So whenever we came across more than one deer in a single location, it was imperative we kill as many as we could." "If you can learn to keep your composure and trust that each shot is true, then you should be able to quickly handle multiple targets." 3: Test of Precision: Hit the farthest target, located in the middle of and far behind the three closest targets. Again, 1 skill point is awarded for completing this task. "We've talked about speed and composure. Now we'll go over precision. Often times you won't be able to get as close to your prey as you'd like and you'll have to settle with a long shot. However, with such a long shot, it's more than likely that's the only shot you'll be able to take before your prey runs off." "OK, your turn. Try and hit that target way in the back, far behind the other three. Remember to take your time and make your shot count." 4: Final Test: Hit all 4 targets within 10 seconds. Note that this round can be challenging to complete. Like before, 1 skill point is awarded upon completion of the task. "We've talked about composure, speed, and precision. Now it's time to use all three at once. I'm warning you now, this challenge will be quite difficult. It may take you a couple of tries, but that's what practice is all about." "Just remember everything I've taught you and you should be able to complete it." Upon completion of all of these tasks, asking Angi for further practice will cause her to remark that "I think I've taught you everything I know. You might even be as good as me now. Kind of scary if I think about it." She'll also be grateful for some company in the wilderness, saying, "Thanks for sticking around and keeping me company. It was nice to finally meet someone out here who doesn't want to rob you or take off your head. I know it isn't much, but here, take this bow. It was given to me by my family. It's special to me, but brings back too many painful memories." She'll give you Angi's bow. For the closest target, the trajectory is flat; aim at or just below dead center. For the target on the left, the arrow lofts or sails; aim at a point about half a target's width on the post below. For the farther target on the right, the lofting is at its highest; aim a full target's width down the post. For the farthest target, the arrow drops back into trajectory; aim about a full target's width above the top of the target. To familiarize yourself with arrow trajectory, aim at a post, where the arrow will normally stick, at varying distances noting where you hit. The only thing missing in Skyrim archery is drift and distance drop. The arrow tends to stay aloft, disobeying trajectory, much farther than they would in real life. With a little practice, you can shoot targets several hundred yards (paces) away. If you can't see the farthest target, try increasing the object detail and view distance in the options menu. You will get six skill increases regardless of your starting Archery skill. Therefore to get the most out of it, you may wait until your Archery skill is 94 and then use Angi's practice to raise it to 100. If a dragon attacks while Angi is walking to the training area for practice, she will not resume walking there after the dragon is killed, and the dialogue option to train with her will be removed. Feeding on Angi as a vampire with the Vampire's Seduction power can result in the Dragonborn clipping several meters in a random direction while the animation occurs, even into the nearby mountainside depending on position. ? This page was last modified on 29 March 2018, at 05:01.